As Legendary musician Bob Dylan sang “Times they are a changing”. The gun market is changing and in many ways for the better – it’s as exciting today to be involved in Sporting Guns as it was many years ago. 25-30 years ago when I first started following my Dad around gun shows, the dealer network controlled the flow of goods to the market and each individual dealer had their own clientele for certain types of goods. There was a great degree of specialization from the dealer and a great degree of trust from the buyers. Typically buyers implicitly trusted their dealers to get them merchandise that was as described, and they trusted their dealers to provide them guidance on prices. “The Gun List” was a main source of bi-weekly entertainment and information. Gun List provided a small peak in to the inventory of dealers and private sellers around the country and the buyer had to rely on the knowledge of the seller and trust that the person on the other end of the line knew what they were talking about and was honest. The other thing back then were the shows. Gun shows provided a further glimpse in to the guns available on the market. Most of the major dealers would attend gun shows every weekend around the country buying and selling guns all weekend long. For most common folks, set up day at a gun show was the stuff dreams were made of with things changing hands at a rapid rate- cash and guns, mostly! Shows eventually evolved and provided collectors a venue for displays and many of the best remaining shows in the country today are of high quality because of the quality of the collector displays that exist. Most of the biggest dealers in the country will tell you that the shows are becoming a less and less important part of their business as internet sales have gobbled up the action. Once the internet came along and took hold, everything changed in gun collecting (and all fields of collecting for that matter). Collectors now had a venue for the easy exchange of information and what was once rare in a regional area had now been exposed, perhaps, as being common elsewhere. Inequities in the market began to subside and slowly the grip that shows and dealers once held on the gun market and gun values started to erode. Auctioneers, which had been forever been general sellers, now started to specialize. First was the specialty of antiques auctions, then fine art, and of course, a specialty in firearms. At the same time, auctioneers started focusing more and more on firearms only auctions. The real spark for auction companies came when auctioneers partnered up with firearms experts. One well known early dynamic duo is that of James D. Julia and noted long time firearms expert and friend, J.R. LaRue. Having been involved in the auction scene for more than 20 years and formally employed in the field for the last 5+, I often get the question “what should I do to be successful with an auction?” The purpose of this article is to help you understand the dynamics of an auction and how to position yourself to be successful when partnering with an auctioneer whether on the buy side, or the sell side (to be discussed later). Buying at auction can run the full spectrum of emotions- truly it can be a rollercoaster. It is often fun and rewarding. It can also sometimes be frustrating and downright aggravating. Let’s talk about the fun and rewarding part first! When buying at auction, there are generally two main reasons why someone will buy at an auction. First, they feel the auction has an item or items that they really want for their collection or inventory. In this case, the buyer has developed more of an emotional attachment to an object and is compelled to purchase for that reason. This is a great scenario and often the most emotionally rewarding. This is also the opportunity that the auctioneer enjoys the most – typically this is when 2 or more parties can get in to a spirited bidding battle and a high, sometimes above market, price, can be achieved. For an auctioneer, it doesn’t happen all the time, but when it does, it is great fun! The second reason people buy at auction is that there is always a chance for a good value or a downright bargain. No matter how hot the auction is, or how big the auction is, there is always an opportunity for the patient buyer to buy something at a great value. For example, while attending a country auction, it could be the used lawnmower that is worth $100 that sells for $35 and thus a handsome percentage profit can be made. At an internationally followed firearms auction, it could be the 28ga Purdey shotgun that should sell for $90,000 that only brought $72,500. Again, a handsome profit can be made. The key component here is that the buyer, instead of focusing on just a couple of items at the auction, must be present at the sale and must be patient in following a large number of items. The smart money can be made during the auction preview in this instance – by reviewing a very large number of items and assessing what the buyer feels is a fair purchase point. While working at Julia’s I realized that many of our most astute buyers came in a couple of days prior to the auction to preview literally every single item in the hall! Throughout any auction, no matter how hot the auction is, no matter where it is located, no matter how well it has been publicized, or what day of the week it is, there are bargains sprinkled in, and your attendance at a live auction always rewarded if you are paying close attention to the person swinging the gavel! Most auction companies provide pre-auction price estimates on the goods they are offering. This is done as a convenience to buyers to help them get a sense as to what an item might bring at the auction. They are sometimes higher than what the item might bring, sometimes lower, and somewhat often they are about where it lands. Astute buyers should use estimates sparingly. In my opinion its best to simply review the goods being offered and determine in your own mind what you might want to pay for the item in advance of the auction. It’s also best to give a small buffer so that even if you have to give an extra bid or two, you are still competitive with the bidding. Of course, before buying anything at an auction (or anywhere for that matter! ), a buyer has some serious due diligence to do. Specific to guns, there are a number of things to consider. First and foremost is the Auctioneer and their conditions of sale. Most often, the conditions of sale is printed in the front of the catalog and available on the website of the auction company. It is important to study these prior to participating in the auction. Some auctioneers sell “As is – Where is” regardless of the description, and they seriously mean it. Once the gavel falls, no matter what the issue is, you will own the merchandise. For this reason, it is imperative that a buyer read and understand the conditions of sale. One highly respected and reputable firearms auction company stands behind their merchandise and they even sell with a guarantee! Their written descriptions are guaranteed to be free from major defect and if there is a major defect, they will simply cancel the sale and refund the buyer’s money! As well, issues such as the auction company’s buyer’s premium (typically 15% added to the hammer price for firearms in the U.S.) will be discussed in the conditions of sale. Some auction houses charge as much as 25% or more! When buying at auction, it is imperative that you read and understand the conditions of the sale to protect yourself from having a major, potentially expensive problem down the road. It’s a critical read. Another topic you will want to know about is regarding reserve prices and that should be covered in the conditions of sale. Occasionally an auctioneer will offer an auction as “totally unreserved” but for the most part, most auctions will have items that carry a reserve price. A reserve price is a confidential minimum price (confidential between the auctioneer and the consignor) that below the reserve price, the item will not be sold. Most of the more honest auction companies will not allow reserve prices within the printed estimates, and for the most part the reserves will not exceed the low estimated price, however there are a few firearms auction companies that allow reserves up to the HIGH estimated sales price. That’s downright unfair to buyers and simply doesn’t feel right! All of this can be found in the conditions of sale. Another thing to consider when looking at an auctions is which auction company provides the greatest level of expertise in the area you are buying. In our world, I want an auctioneer that provides solid measurements on the gun I am considering. Things like Length of Pull, Barrel length, chamber length, bore measurements, and wall thicknesses make a big difference in a gun. An auctioneer that provides these things on more valuable items is clearly an auctioneer of choice for a higher end astute buyer. There are 4 main ways to participate in an auction nowadays. The most obvious and most fruitful way to bid at auction is to bid live and to be in attendance. If you are there, you can get a feel for the tempo of the auction and you can see what the action looks like on lots you might even have just a passing interest in. You’ll also be able to see who you are competing with and occasionally the auctioneer will explain the auction process including whether or not there are absentee and reserve bids on a lot. Furthermore, you are more likely to find a true value if you are present. The second, and most popular way to bid absentee is via phone bidding. Most auction companies allow for a small group of phone bidders on higher value items. If there is only a handful of items or less that you might be interested in within the auction, phone bidding is a convenient way to participate in the sale for those items. It is not without potential pitfalls and the auctioneer will tell you that they cannot guarantee you will be called for your lots. Major auction companies can often times have 12 or more phone bidders on the line for any given lot. However, occasionally, even the most prepared auction companies cannot get through to a phone bidder at the moment a lot is on the block. Thus, a bidder will be disappointed as he is not able to participate. A third way to participate in the auction is via internet bidding. 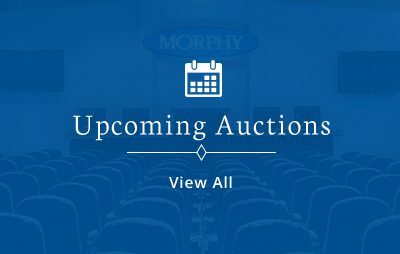 Many auction companies have now partnered with one of the major internet auction websites such as Invaluable, Proxibid, or with Morphy Auctions, we have our own proprietary site, MorphyLive. These websites allow the user to follow the auction from the comfort of their home in front of their own home. The internet bidding typically comes at a premium to the buyer to the tune of 2-5% in added cost to your bidding. The other thing about internet bidding is that as the auction changes in tempo, it might be difficult to get a bid in and executed in time before the gavel falls. It can be convenient, but it can also be aggravating if your connection fails or if you miss a bid. No doubt, this venue is growing and more and more companies are offering this convenience to their clients. Particularly at the lower end of the market (Sub $5,000 guns). The fourth and final way to bid at an auction is through a representative. Some high end collectors hire specialists to vet items above and beyond the auctioneers description and then to bid for them at auction. Auction representation works well if the buyer and the representative have a strong trust and the buyer wishes to remain anonymous. This type of service typically costs 3-7% as a commission to the representative but these fees are totally separate from the auction company fees. Another issue to be aware of if bidding absentee is that of shipping. Will the auction company assist you with shipping? Many firearms houses have in-house shipping departments but there are a few houses that will refer you to an outside shipping vendor. Shipping charges and insuring your new toy in transit can get costly so it’s important to know what you’re facing and you should ask the auction company what to expect in advance of bidding to avoid any significant surprises. Finally, once you’ve gotten your new toy home, let the auctioneer know that you are pleased with their services. One of the most rewarding parts of working for the auction company is a note from a buyer or consignor telling you how pleased they are with your efforts. It’s also very helpful to the auction company to have letters of testimonials to share with new clients who may be hesitant about working with them. ***Josh Loewensteiner is a Firearms Specialist for Morphy Auctions in Denver, PA. He has actively collected American sporting guns with his father for nearly 30 years. Josh is a member of many of the collectors associations and a Life Member of the NRA. Josh works out of his home in Charlotte, NC and travels the country meeting with buyers and sellers alike and attends approximately 20+ major gun shows annually.